Mystery of sick foals: Was fracking to blame? From a mile away, Allerage Farm’s magnificent harness racing barn can be seen amid rail fences, rolling pastures and red and white outbuildings on a hill rising some 1,500 feet from the Susquehanna River basin. Drawing near, the Bradford County, Pennsylvania postcard comes to life. Foals gambol near watchful mares. Staff, dressed smartly in black polo shirts, lead their equine charges to assigned stables and pastures. At the very top of the hill sits a gabled manor from which the farm’s owner — real estate and racetrack magnate Jeff Gural — can take it all in. Yet for all its beauty, Gural's horse-breeding farm holds a disturbing mystery health experts and the federal government are working hard to solve. For three years, the mares have been bearing foals with dysphagia — a rare, life-threatening condition preventing them from swallowing properly. 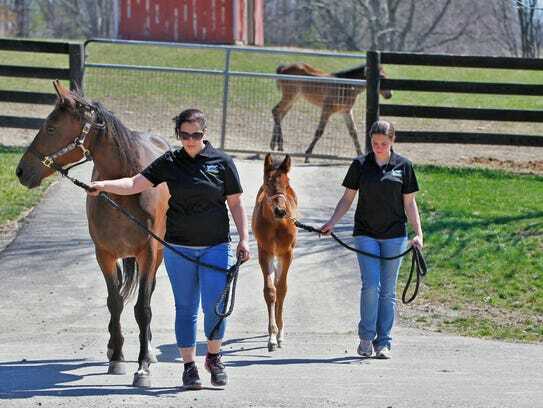 Although researchers have yet to pinpoint a cause, a Cornell University veterinary team that saved 17 of Gural's standardbred foals has identified a primary suspect — a gas well drilled directly next to the farm by Chesapeake Appalachia LLC. An investigation by the Pennsylvania Department of Environmental Protection confirmed the farm’s water was contaminated. However, it concluded Chesapeake operations was not the cause. Big money, land rights and health hazards have been salient story lines in Pennsylvania’s shale gas bonanza. The mystery on Gural’s farm, however, represents a new twist in the power play between landowners, regulators and the gas industry. For years, farmers have been dealing with water contamination and illnesses that common sense tells them is caused by nearby shale gas operations. But they generally face a burden of proof requiring legal and scientific resources beyond their means. Regulators, industry and health officials, meanwhile, often explain problems like polluted water wells as resulting from natural and pre-existing phenomenon. But Allerage is not your average farm, and the foals are not your typical animals. With some horses potentially worth six figures, Gural wants answers. His lawyers have filed an appeal with the Pennsylvania Environmental Hearing Board demanding state regulators conduct a more thorough investigation of his farm’s water. The farm, which opened in Pennsylvania in 2007, is more than an investment for Gural. It’s a passion. The name, Allerage, is a combination of the names of his three children: Aileen, Eric and Roger. Gural’s veterinary team at Cornell has been conducting its own study funded by a $240,000 grant from the National Institutes of Health, an arm of the U.S. Department of Health and Human Services and the nation’s medical research agency. This study involves not only water chemistry, but a search for compounds in the soil, air and forage as well as in the blood and tissue of the horses themselves. Gural arguably could be one of the most influential part-time farmers in the Northeast. His breeding operations include more than 100 horses distributed between Sayre and a second farm in Dutchess County, N.Y.
Allerage Farm is a quick 6-mile drive south over the state border from his Tioga Downs Casino Racing & Entertainment complex in Nichols, N.Y. — a facility this year due to explode into a full-scale casino with table games. A big part of the current operation is the Tioga harness racetrack. In addition to real estate operations in New York and New Jersey, he also operates Meadowlands Racetrack in East Rutherford, New Jersey and Vernon Downs in Oneida County. At the heart of the mystery of the foal's illnesses at Allerage is the proximity of gas wells. The foals on the Dutchess County farm, where there is no drilling, all have been healthy. But 17 foals on the farm in Bradford County near the Chesapeake well have been stricken at birth over the past three years. Although all the sick foals have been cured with treatment at Cornell University’s College of Veterinary Medicine, the problem has posed a life-and-death struggle during the first weeks of their lives. The most recent victim was Flash, a bay beauty with an impressive pedigree. His father, Yankee Glide, was a dominant trotting champion winning more than $500,000 in purses in two years of racing. His mother won more than $150,000. Flash seemed perfectly healthy when he dropped into the world in late March. But, within hours, as he stood on his spindly legs and began nursing, his handlers recognized the telltale signs. Milky froth bubbled out his nostrils. Later, a rattling noise developed in his chest. The hungry foal was aspirating his mother’s milk. Without emergency care, he would die of pneumonia. When treatment is required, the foals, accompanied by their anxious mothers' handlers, are guided into a trailer for the 50-mile back-road trip to Cornell. There, clinicians usher the team into a medically-equipped stable, insert a catheter to administer sedatives and antibiotics and a tube down the foal’s trachea for nourishment. Each foal has been cured after treatment, with the regimen lasting from a week to a month and costing between $5,000 and $10,000. Five of 10 foals born on Gural’s Pennsylvania farm were afflicted with dysphagia in 2014 and 10 of 11 in 2015. Although mares are sometimes moved between the New York and Pennsylvania farms, mothers of the sick foals share one obvious connection — they drank water at the Pennsylvania farm during their pregnancy. Some mares have also had problems with their reproductive cycles, a major concern on a breeding farm. With the water a prime suspect, Gural added a $40,000 upgrade to the Pennsylvania farm’s water filtration system in October. Meanwhile, farm staff awaited the birth this spring of three foals whose mothers had been exposed to the water prior to the upgrade. The foals arrived in March. Two of them — Flash and Oscar — developed the telltale rattle in their chest within a day of their deliveries. The babies will be given race names when they grow into competitors. Their “barn names” typically reflect the circumstances of their birth. Flash was a quick delivery that came a week early. Oscar was born during the Academy Awards, and Ester, a biblical name, was born over Easter weekend. Like puppies or kittens, foals have distinct personalities and a universal cuteness. 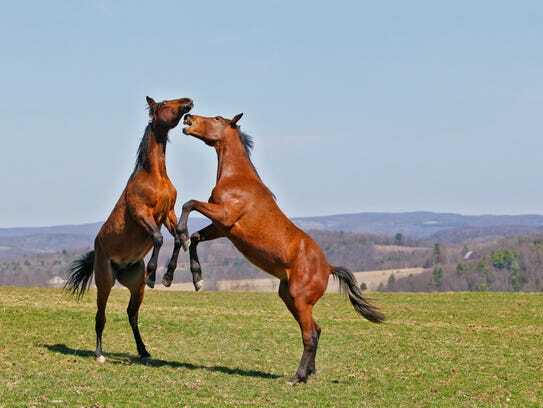 When Flash gets riled, he bucks and kicks in jerky sideways movements to show his machismo — a display comical in a foal but intimidating in a colt. It’s a drill the colts on the farm are always practicing against each other while loose in the corrals. Gural and his team are counting on the new water filter to put an end to the problem, but with the equine gestation period lasting 11 to 12 months the results won’t be known until later this year and early next. Though wary, Gural is not rushing to judgment about the nearby gas well. He is on record as a supporter of shale gas development — a position he emphasized in a recent interview at the farm. Roughnecks and roustabouts, pioneers in developing northern Pennsylvania gas fields, were frequent and welcome customers at Tioga Downs, less than an hour’s drive for many of them. So were landowners receiving royalty payments who might have spent some of it at Gural's casino complex. 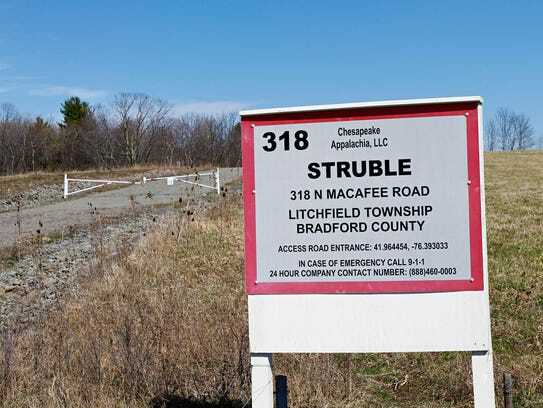 Gural said he would entertain the idea of putting a shale gas well on his Tioga Downs property if fracking were approved in New York. But he does not unconditionally hold the industry blameless, making it clear he doesn't approve of some of Chesapeake's business practices. Gural, candid and approachable, was dressed in jeans, work shirt and a cap bearing the name of a feed company. With casual exchanges with his barn staff, he conveyed an impression more of a farmer than a real estate/casino tycoon. He walked toward a stall where Flash, recently returned from Cornell, lay resting in the hay near his mother. Gural reported his wife, Paula, feels strongly the dysphagia was unrelated to shale gas development. The conversation turned to a federal exemption — commonly known as the “Haliburton loophole” — allowing the fracking industry to withhold specifics about chemicals injected into the ground to stimulate gas production. The complaint over secrecy is at the center of his appeal to the Pennsylvania hearing board reviewing his case against the state environmental agency. Testing has shown Allerage Farm's well water is contaminated with levels of manganese, iron, aluminum and turbidity exceeding state standards. Before installing the new filter system in October, the farm used a sediment filter, which was effective until problems began cropping up with increasing frequency in 2014. Gural’s lawyer, Martin Siegel, says the scope of the tests — covering only two dozen fundamental compounds — was too narrow. According to the appeal, the DEP failed to request or even consider information from Chesapeake regarding hundreds of substances used or possibly spilled at the well pad, let alone test for them. “Substances used by Chesapeake but not sampled for could be … the cause of the health problems suffered by the foals,” states the appeal, filed with the hearing board in February. Suspicion about the water represents “the needle in the haystack” for which Gural and his breeders are looking. If the source of the mystery isn't the water, a solution can be far more complicated. Drilling has been known to compound existing water problems. Gas wells also produce air emissions from methane and other constituents rising from a mile below the ground. These impurities are bled off at wellheads and compressor stations or escape through leaks in the system. In addition to the gas well adjacent to Gural’s farm property, 10 other sites operate within 5 miles of the farm. Their emissions are invisible but potent. While the exact recipes for millions of gallons of solutions and fluids injected into and produced from the sites are proprietary, studies put the number of chemical compounds at 632. Of these, 353 cause illnesses to people or animals exposed to enough of them.